Levitt AMP Chattanooga Music Series Returns! The Levitt AMP Chattanooga Music Series returns for a second year to invigorate the lawn of the Bessie Smith Cultural Center in the historic Martin Luther King district, once again shining a light on the area’s renowned musical heritage and building upon the momentum of the past year to solidify its position as a thriving cultural destination. 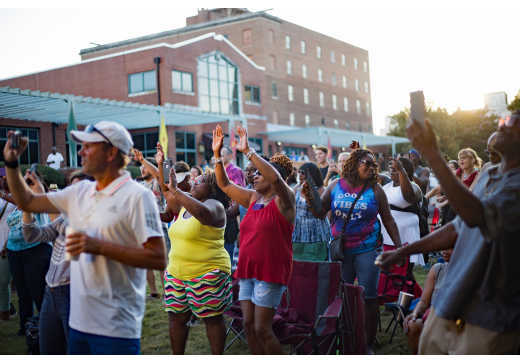 There will be ten weeks of free, live music on the lawn of the Bessie Smith Cultural Center featuring local, regional and national talent. August 23-October 25, 6:00-9:00pm. The Levitt AMP [Your City] Grant Awards is an exciting matching grant program made possible by the Mortimer & Mimi Levitt Foundation, a national creative placemaking funder dedicated to strengthening the social fabric of America through the power of free, live music. With Levitt AMP, the joy of free, live music is bringing communities together in small and mid-sized towns and cities across the country. The Levitt AMP [Your City] Grant Awards are specifically designed to meet the needs and capacity of small to mid-sized towns and cities. Since 2015, the Foundation has awarded $1 million total to 25 communities across America through the Levitt AMP grant program. Grants are awarded to up to 15 U.S.-based nonprofit organizations serving towns and cities with populations of up to 400,000. Each grantee receives $25K in matching funds to present the Levitt AMP [Your City] Music Series, a minimum of 10 free outdoor concerts presented over 10 to 12 consecutive weeks during 2017. Each Levitt AMP Music Series will feature a musically diverse lineup of high caliber entertainment, in keeping with the permanent Levitt venue program. Amplify community pride and a city’s unique character. Enrich lives through the power of free, live music. Illustrate the importance of vibrant public places. How did Chattanooga Win the Levitt AMP Grant? After learning about the Levitt AMP opportunity, a group of five community partners came together to apply for this highly competitive national grant. Partners included: Jazzanooga, Urban League of Greater Chattanooga, Bessie Smith Cultural Center, Chattanooga Convention and Visitors Bureau, and the City of Chattanooga’s Office of Multicultural Affairs. October 2016 & 2017: Chattanooga applied for the grant. November 2016 & 2017: An online public voting competition occurred between 53 cities during the month of November. Chattanooga encouraged the community through stickers, flyers, press announcements, social media, blogs, etc. to vote to bring the Levitt AMP Music Series to Chattanooga. The community rallied together, and we placed in the top 25, becoming eligible to enter the final review process. Nov 21-Dec 31, 2016 & 2017: The Levitt Foundation reviewed the top 25 finalists. January 2016 & 2017: Chattanooga was announced as 1 of 15 cities to be awarded the 2017 & 2018 Levitt AMP Music Series Grant. Two Chattanooga foundations, Benwood and Lyndhurst, have provided funding to match the grant, helping Chattanooga to win this award, and have provided additional funding to enhance the concert series. 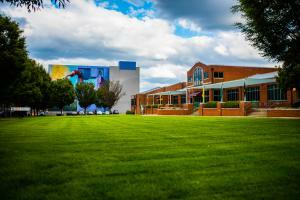 Why the Lawn at the Bessie Smith Cultural Center? The Bessie Smith Cultural Center is located in the heart of downtown Chattanooga and is the physical and symbolic gateway between the MLK neighborhood and the central business district. MLK Blvd., formally known as the “Big Nine,” was once a live music hub for African American communities in the Southeast. This music series will reinforce the neighborhood’s unique identity as an entertainment landmark, shining a light on its musical heritage, but also its bright future. The BSCC has ample parking and is easily accessible to the city’s bus line and bike share. Animating the beautiful lawn at the Bessie Smith Cultural Center will help draw the public and tourists once again to the neighborhood to experience live music and learn about the cultural heritage of the Big Nine. Free, live music! Including a variety of genres with high-caliber local, regional and national talent. A new opportunity to relax and enjoy your leisure time! Blankets and chairs are encouraged. Celebration and inclusivity; all ages and all backgrounds are welcome. Local food vendors and beverages for purchase. There will be a wide variety of genres, some familiar, some new…including local, regional and national talent. Although every performer’s genre will vary, each artist will tie into the history and heritage of the Big Nine, continuing to enhance the neighborhood as a cultural destination. See the full lineup here. Check the schedule here: concerts.levittamp.org/chattanooga. And be sure to sign up for Jazzanooga&apos;s newsletter.